OPPO introduced F11 Pro smartphone last month. 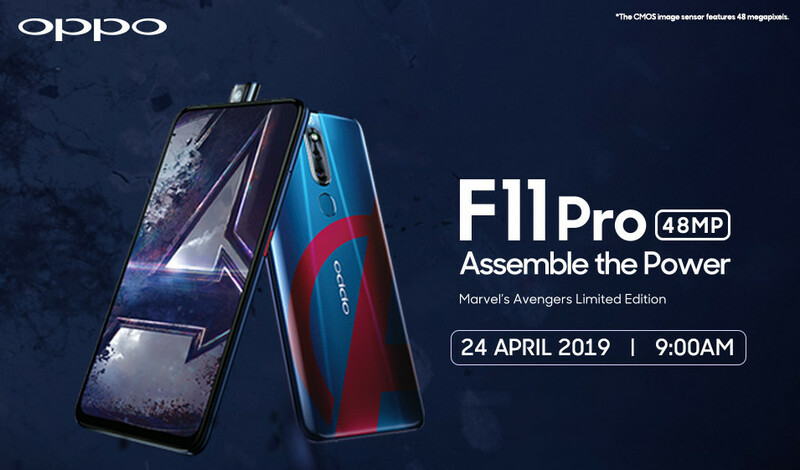 Now the company has announced that it will introduce Marvel’s Avengers Limited Edition in partnership with Marvel in Malaysia on April 24th, ahead of the movie release next week. This comes with Blue and Red colors along with Avengers logo on the back similar to Captain America logo. It will also come with 128GB storage compared to 64GB in the standard version. Other specifications are similar, including a 6.5-inch FHD+ Panaromic screen without a notch, has 90.9% screen-to-body ratio, MediaTek Helio P70 12nm processor with 6GB of RAM, Android 9.0 (Pie) with ColorOS 6.0 on top, 48-megapixel rear camera along with a 5-megapixel secondary rear camera, 16-megapixel rising front camera and a 4000mAh battery with VOOC flash charge 3.0. We should know the price when it goes official next Wednesday.